Franklin & Marshall College welcomes talented students from all economic backgrounds. That is why financial aid at F&M is based solely on need. We define need as the difference between the cost of attending F&M and the amount a family is expected to contribute. 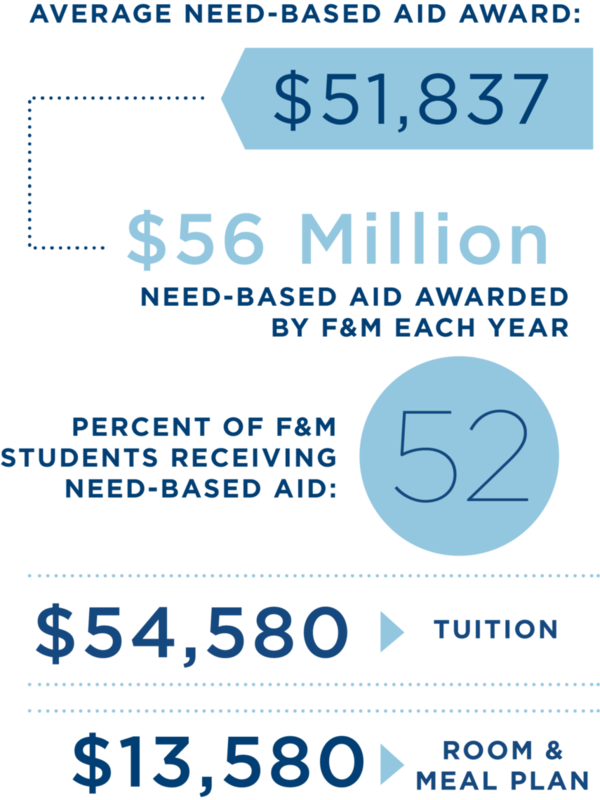 Need-based aid typically comes in three forms: grants, loans, and campus job opportunities. The amounts of each will vary. Loans and campus jobs are labeled "self-help" since the student has the opportunity to help meet the cost. Grants are sometimes called the gift portion of an aid package. Gifts typically includes College-endowed funds that are used to make up the difference between self-help and overall demonstrated need. Grants do not need to be repaid. Calculate Your Need in 20 Minutes! Use our Net Price Calculator to estimate the difference between our cost and any need-based aid for which you may be eligible. Need-based aid includes federal and state grants, F&M grants and scholarships, Federal Direct Subsidized Loans and Federal Work-Study. Cost of Attendance: college expenses for one academic year (9 months). Tuition and fees, room, meal plan, books and supplies, transportation, and miscellaneous educational expenses. Expected Family Contribution (EFC): Calculated from the information that you/your parents provided on the FAFSA and CSS Profile. It is used to determine the types and amounts of need-based financial aid for which you are eligible. Financial Need: Your financial aid eligibility. Number of children/student’s siblings enrolled full-time in a four (4) year, undergraduate degree program. A minimum student earning contribution of $1,550 is expected in the first academic year. A minimum contribution of $2,150 will be expected for next three (3) academic years. Students who are admitted to the College and who qualify for need-based financial aid will receive an aid package letter from the Office of Financial Aid included with their notification from the Office of Admission. An aid package letter includes all Federal need-based aid and Franklin & Marshall need-based aid. The letter will also include information regarding the cost of education for the upcoming year. Subtracting all aid awards from the cost of education allows families to estimate their out-of-pocket expense for the upcoming school year. If financial expense is important to your family, having your financial aid letters from all of the colleges to which you are applying allows your family to compare packages. This is an important part of the process, and one in which the "cost versus value" of an education enters the discussion.